A few months ago the Station Partnership embarked on improving the approach to the station by planning artwork in the window spaces of the old station building. What to put in the spaces? No problem – our young people at the local schools soon had the first artwork ready. Under the guidance of artist Annie Lawson and their teacher Janet Normanton, Scout Road school students produced the first Window Art. 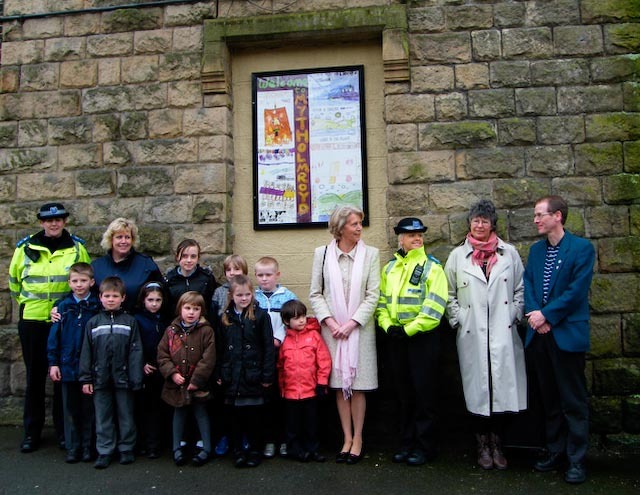 Here we see the Lord Lieutenant of West Yorkshire, Dr Ingrid Briscoe, with our talented students and on the right is Nigel Oliver from Green Business Network who sponsored this work. More is planned, watch this space! Over twenty volunteers attended our annual spring-clean, despite the torrential rain and gales. Many thanks to them and to Jason Boom, Envronmental Warden of Hebden Royd for organising things.